Long-time readers know that I assign great importance to swap spreads. They have been excellent, forward-looking indicators of important financial and economic fundamentals. For example, note in the chart above how spreads rose well in advance of the onset of the 2008-9 recession, and how they fell well in advance of the end of the recession in mid-2009. U.S. swap spreads have been very low and stable for over a year now, and despite the turmoil in the Middle East, soaring oil and gasoline prices, the declining dollar, hand-wringing over the Fed's QE2 program, and trillion-dollar deficits for as far as the eye can see, swaps haven't budged (well, except for a brief scare last April-May when the prospect of Eurozone sovereign defaults threatened and many started predicting a double-dip recession). That tells me that our financial market is on sound footing; there is no threat to the banking system or the economy on the horizon, liquidity is back where it should be, the economy doesn't suffer from any liquidity shortage, and confidence in the future has been reestablished. Low and stable swap spreads mean that systemic risk is very low. Whatever problems we face today are likely to resolved without significant economic or financial market disruption. And yes, that implies that the trouble in the Middle East and $100 oil prices are not likely to topple the still-might US economy. 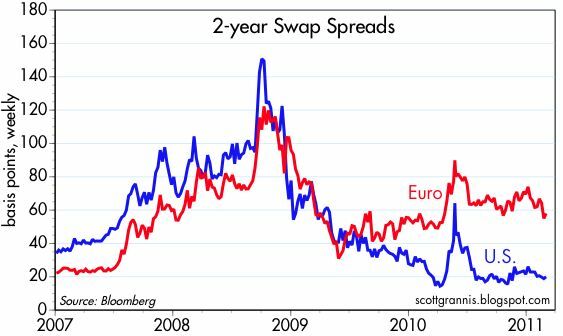 The picture isn't so bright in Europe, however, with swap spreads still at levels that reflect unusualy systemic stress (e.g., the likelihood of some unpleasant things happening like a Greek default or debt restructuring). Things haven't heated up enough in Europe to disturb stock markets or the value of the Euro, though, but perhaps swaps are telling us that will be the next shoe to drop. In any event, with swaps elevated, I would approach Europe with caution.